Too wide of a turn caused an Aer Lingus plane to scrape its wing on a concrete pillar at SFO. The collision involving the Airbus 330 stranded passengers overnight Wednesday and late into Thursday. 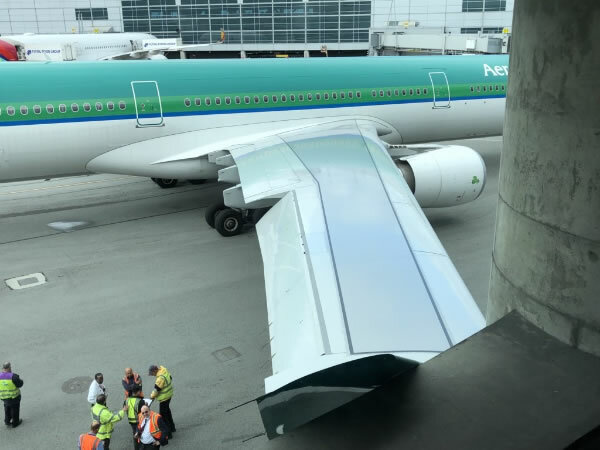 SAN FRANCISCO INTERNATIONAL AIRPORT (KGO) -- Too wide of a turn caused an Aer Lingus plane to scrape its wing on a concrete pillar at SFO. The collision involving the Airbus 330 stranded passengers overnight Wednesday and late into Thursday. "Aer Lingus has just been so rubbish in terms of giving any information, any proper detail about what's going to happen," said Karen Martin, who was trying to get home following a vacation in California. Martin and Stuart McGeown are trying to get back to the UK. They say police officers were brought in for the frustrated crowds at the ticketing counter Thursday. "We arrived today and there's four police officers there for the 3:30 flight, the midday, so they knew the flight wasn't going at 3:30," said McGeown. The delays are an added hurdle for the many Irish ex-pats trying to get home to vote by Friday. A referendum could overturn Ireland's near-total ban on abortion. "So yes we are very happy to go home for the vote because tomorrow is the vote until 10 o'clock in the nighttime," said Monica Bermajo, a member of the stranded Aer Lingus flight crew. Flying across the Atlantic on a recently repaired plane is unnerving for some. "Apparently they're flying three engineers out from Ireland. One earlier, two later to fix it. I don't know how I feel about that. Well, no. I feel really uncomfortable about that, really uncomfortable," said Martin. Flight attendant Bermajo said there was nothing to worry about, "Not at all. We have a marvelous flight crew." With a repaired wing the plane departed SFO at 8:55 p.m.